GOLD. 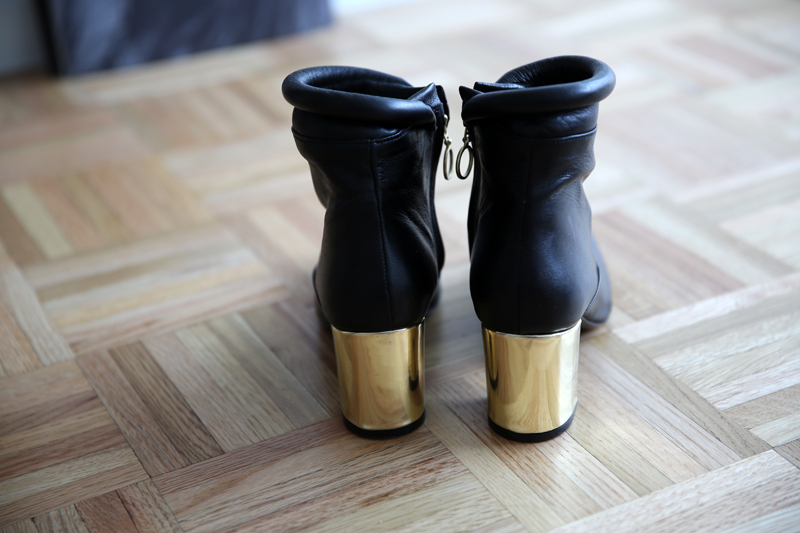 Say hi to my new bad boys from Carin Wester, obsessed with the gold heel! This entry was posted in Details by Carolina Engman. Bookmark the permalink. Don’t miss today my Black&White look…..with my Alexander Wang style heels!. WIN an amazing pair of Luxury SHOES – Worldwide Giveaway!!! they are so nice! want them! WIN A PAIR OF ARMANI SUNGLASSES ON MY BLOG! Love them! Topshop do a similar style that I’ve had my eye on for a while! The Deep Blue Cory Fashion Blog : NEW POST! Very cool! So unique, I love them! These are so awesome!! I love the heel! Love these heels! That gold heel is perfect!! LOVE the gold metallic heel. What a fabulous little detail! Can’t wait to see them in an outfit! This must be the perfect black boots for every day! A great high, the golden detail, … just amazing! They look fab, can’t wait for more pictures! I need boots… With heels like these… Or just these boots in general. in love with the gold heels! The gold heel is gorgeous but I also love how it wraps around the ankle! That is a gorgeous statement heel! The gold heels just ooze super cool! Can’t wait to see you in them! Beautiful boots, love the heel! So cool boots and I love them! Pretty cool <3 Can't to see you wearing them !! Can’t wait to see how you’ll style them! those are unreal! that heel is beautiful and seems like it will be so much fun to work into outfits. Faboulos boots! the gold heel is so special <3! So stylish… I’m falling in love!!! I love shoes with that style. Super cool. Wow amazing boots my dear. Kisses. Omg I am loving those shoes! Obsessed with your blog! Great job! Great boots. The gold heel is such a cool luxe touch. So glad I found this blog of yours. This is blog is awesome! Wanna follow each other on Google Friend Connect, Bloglovin’ and Facebook? Let me know okay! Such a cool pair of boots! The gold heel is insane!